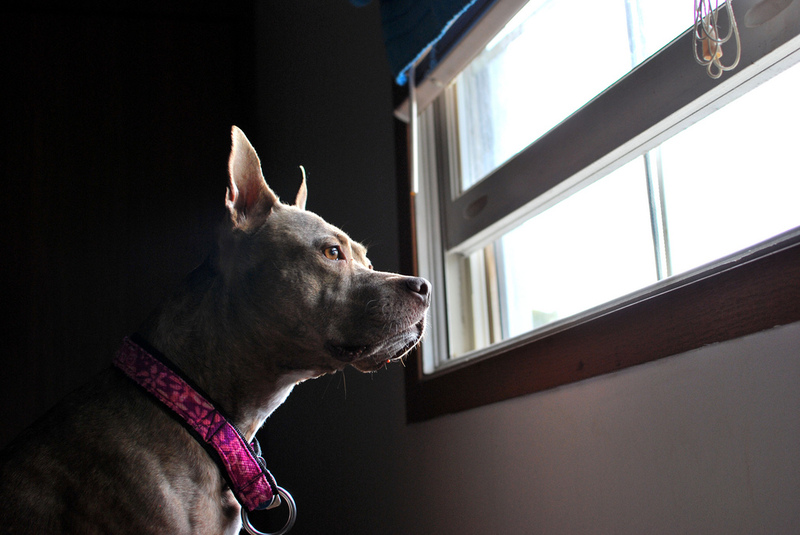 Tips for getting better photos of your pets. You know that here at we LOVE pet pictures. Just a quick look at our Facebook page will show you. And what we love even more is contributions from our clients. Any time you snap a great shot of your pet, feel free to either share it directly on our Facebook page or email it to whiteoaksvethospital@gmail.com and we’ll share your pet’s photo with the world. I thought it would be fun to run through a basic list of tips for getting better photographs of your pets. There are some simple things that you can do and pay attention to that will improve your pictures whether you’re shooting with a fancy dSLR camera or your cell phone. Lighting is a big thing. Good light will allow your camera to capture more action, and will give you a clearer photo, especially if you’re using a cell phone. Flash can be ok, but a lot of times, the light it produces is extremely harsh and washes out the good colors in your images. It also gives you the scary glowing eyes you see in so many quick impromptu snaps. So you want to make the best use you can of natural light. Outside it’s pretty easy. The light early in the morning and heading on toward evening is going to be the best, and you want to shoot with the sun behind you whenever possible. At noon, the light is often harsh, and especially with very light or very dark dogs, getting a good photo can be tough. Indoors is harder. Unless you have a lot of good lighting in your house, it’s often too dim to get good photos, especially action shots. Setting up a “photo shoot” by bringing extra lamps into a room can help. But you also want to take advantage of natural light coming in through windows. Cats are especially good at finding sunny spots to lounge in, and it is easy to take advantage of this to get good pictures! Sunlight coming in a window in an otherwise darker room can also create a really neat “spotlight effect”. 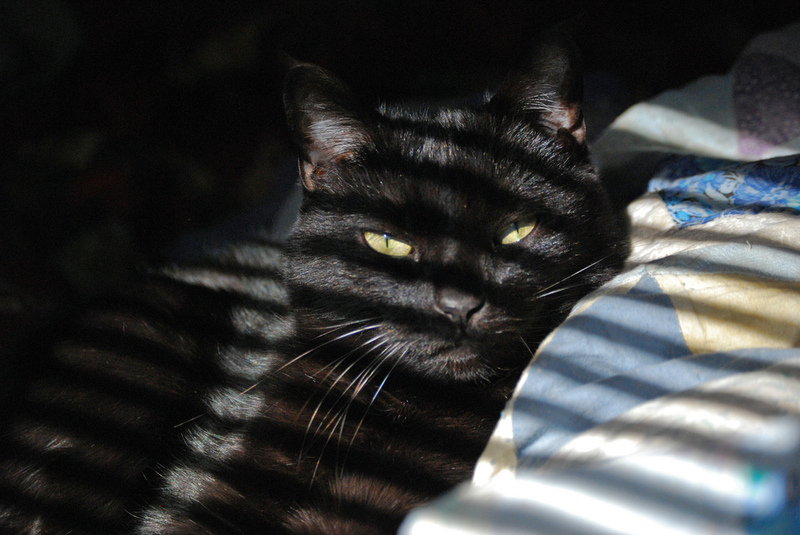 The sunlight can light up your pet, but leave the rest of the room dark. Especially handy for hiding the unfolded laundry on the dresser or the destuffed toy pieces on the floor. The biggest tip for backgrounds is pay attention to what’s there! It is so easy to put your focus on the subject of your picture (your pet) and not pay any attention to what is behind them. This can end up with embarrassing photos on occasion (we’ve all seen them, right?) but it can also just clutter up what would be a lovely photo. By paying attention to what’s there, sometimes you can simply shoot from a different angle to cut out the clutter. Move around, experiment with shooting from a high angle or a low angle, framing the photo with the pet on one side or another instead of in the middle. The best backgrounds are ones with consistent textures– grass, sky, water, a blanket, a blank wall. They are non-distracting and let the viewer focus just on your pet. Grass and trees behind Macie blend nicely into a non-distracting background. But sometimes it is fun to do precisely the opposite- use an especially interesting background to enhance the photo. Here we captured Ein the Corgi on the rocks of a crazy trail that we were hiking up. 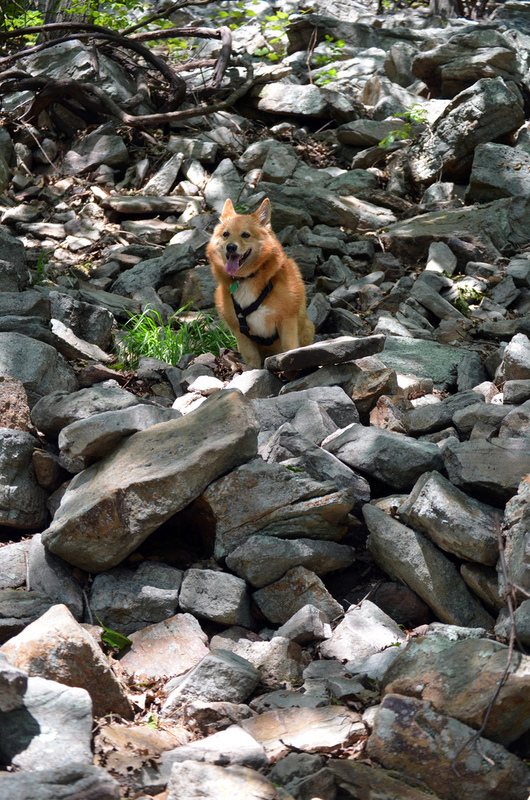 To show the scope of the rocks and the steepness of the terrain, we included Ein’s cute little self. Climbing a really big hill. Get down on their level! By getting down level with your pet and shooting straight on, you’re better able to capture your pet in a natural way. Looking down all the time can create weird angles, and it also will frequently hide the cute face of your pet. A straight-on photo, instead, will capture all the cuteness. Getting down on puppy level can sometimes be dangerous! Portraits are great for capturing the expression, personalit, and soul of your pet. Whether you’re shooting a full-body portrait or a close-up, I really think portraits do the best job of capturing the essence of our pets. A beautiful portrait can be a very special thing for a pet owner. If your dog knows a basic sit/stay, it can be easy to take good portraits. To get their attention on you, you can crinkle a plastic wrapper, whistle, make funny sounds, wave treats around, even use a squeaky toy. You can use the “bait” to move your dog’s focus from straight on to profile or whatever you’d like. It is often useful to enlist the help of an assistant who can be in charge of keeping the dogs in place as well as doing what is needed to perk up those ears. Cats can be trickier, but some of the same rules apply. 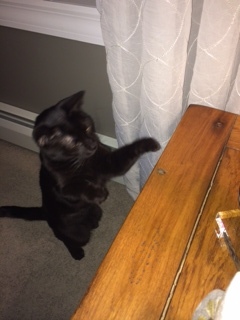 While I’d fall off my chair if I ever had a cat who would stay in one place because I requested it, toys and treats are great ways to get your cat to look pretty for the camera. You have to be quick with cats, though! It seems like they are constantly in motion whenever they’re in front of the camera. Here I used a feather toy to get Figment’s attention (and to keep him where I wanted him). Action shots are so much fun. Capturing your dog running with his lips flapping everywhere is a hoot. Catching your cat at the moment he flips a catnip mouse into the air is priceless. Action shots can be full-body or they can be close-ups. Again, enlisting the help of an assistant can be tremendously useful. 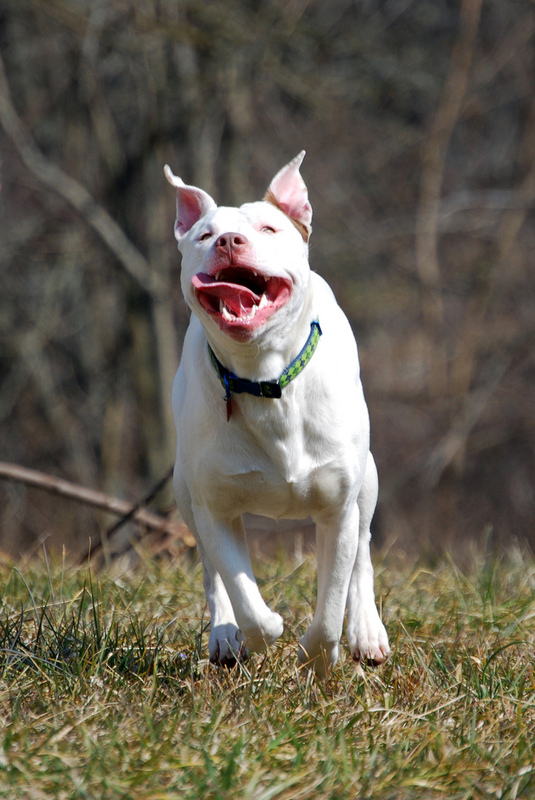 A well-placed thrown toy can help you get the photo of your pet running toward you or across a field in front of you. Teasing a cat with a toy and getting him jumping around creates wonderful, sometimes hilarious photos. In this case, Zen was being called across the field, giving me the opportunity to snap a head-on, lips-flapping view of him as he returned enthusiastically to his owner for a treat. Big mouth bully on the run. Candids are great, too! Keep your eyes open and your camera handy, your batteries charged and your memory card installed. There are photo ops around every corner, and capturing those special moments with your pet can help you hold onto your memories for a lifetime. Nothing does flappy lips like a St. Bernard. I hope you found this post useful and inspiring. We would absolutely love to see what you can do with your camera. Please please share with us, either in the comments here, by email, or on Facebook. Everybody loves showing off their pets, so see what you can do to capture special moments. Think outside the box! Use different angles, dress your pet up in a funny hat, pose them somewhere unexpected, use the filters built into your camera or phone (Instagram, anyone? )– whatever it takes to capture your pet’s unique personality. With the Olympics in progress, I thought it would be fun to go over the huge variety of different dog sports out there for people to participate in with their dogs. There are so many games out there to play with your dog, whether you’re competitive-minded or not. 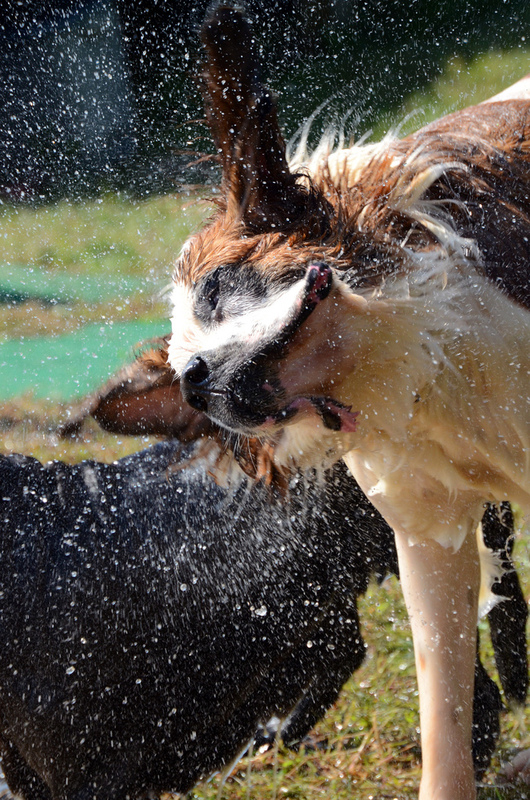 Anything that gets you out doing something fun with your dog is a huge benefit to you both, so check out this list of dog sports and see if there is one that fits you and your dog’s personalities. Zipper the MinPin heeling a serpentine on a rally course. Photo by Kevin Devine Photography. No matter what sport you choose, the first place to start is almost always going to be a basic obedience class. 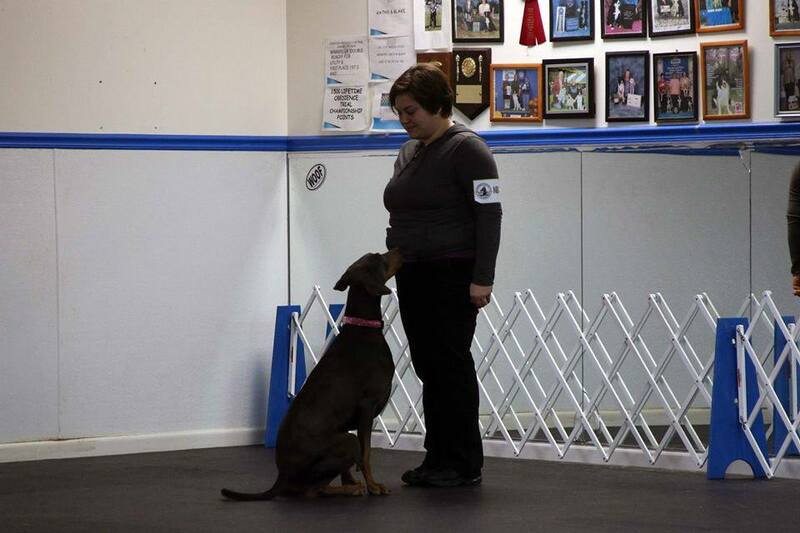 Obedience classes aren’t just for teaching your dog to sit and down and stay. They are where you learn how to effectively teach your dog. How to communicate with him. How to get the behaviors you want, and get rid of the behaviors that you don’t. Once you learn this skill, you can apply it to anything, from sitting for petting from strangers to running an agility course at a high speed. The easiest sport to transition into from beginner obedience is typically Rally Obedience. Rally Obedience is such a fun sport. 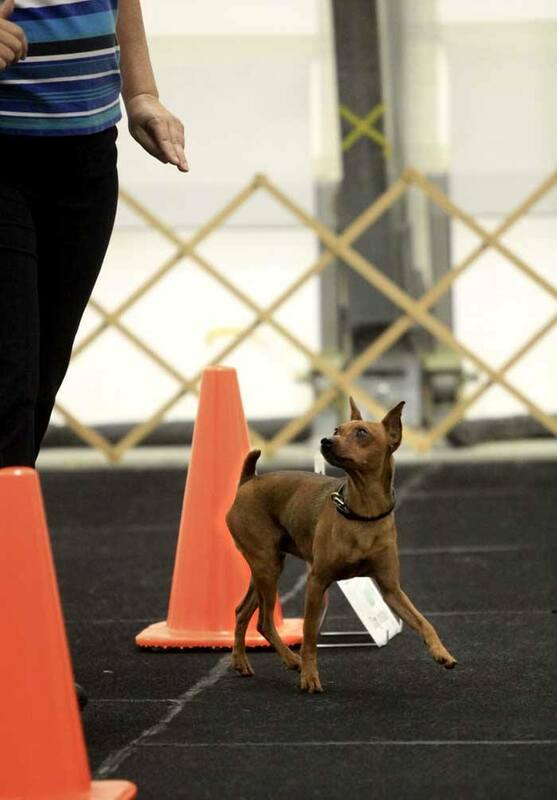 It combines elements of obedience with a course set-up similar to agility. You never know what you’re going to get, and you have to put thought into what the best way is to navigate through the course. In the Beginning Level, the dog is on leash. You can talk to him the entire time you’re out there with him. You follow the signs that tell you what to do at each station (all kinds of turns (90, 180, 270, 360); all combinations of sits, downs, and stands; heeling through cones, and in the upper levels things as complicated as sending the dog over a jump or having him change positions from a stand to a sit with you at a distance). This sport is offered by a number of different organizations including the AKC, the UKC, and Cynosport. In Cynosport, you are allowed to feed your dog treats in the ring to reward him. 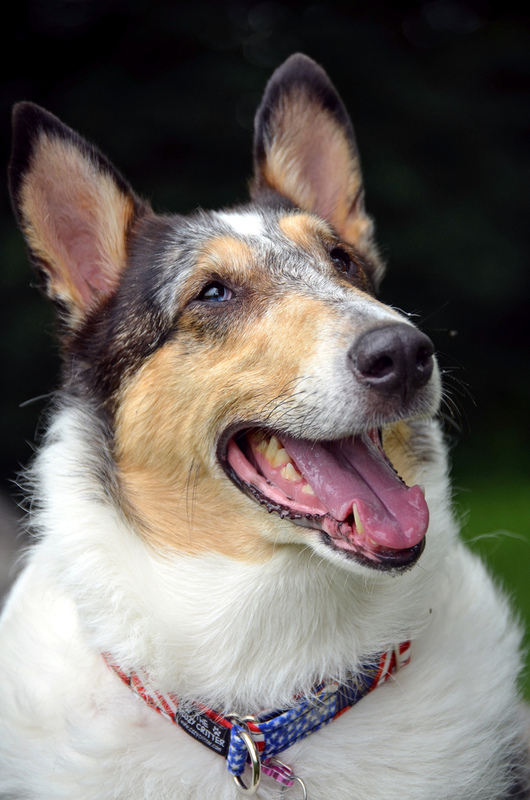 All three organizations allow mixed breed dogs, but they do need to be registered with the organization in order to compete. Cherrybomb the Doberman performs the recall to front. Photo by DPCTZ. For those people who are very detail-oriented and enjoy precision, traditional obedience may be a good choice. In traditional obedience, the game is much more rigidly structured. You may only speak to your dog at certain times. Straight sits, perfect heel position, and all the picky little details are judged much more stringently in traditional obedience. But it can still be a fun game. In the Novice level, dogs perform a heeling pattern called out by a judge both on the lead an off, a figure 8 around two people, a stand while the judge does a very minimal “exam” while the owner stands six feet away, a recall across the ring, and group sit stays and down stays. In the upper levels, things get far more interesting. There are jumps. There is retrieving. There is picking out a specific item from a group of similar items based solely on scent. It’s a lot to learn, but all that work with your dog is priceless, as long as you are both enjoying it. Again, there are a variety of organizations that offer Obedience trials. 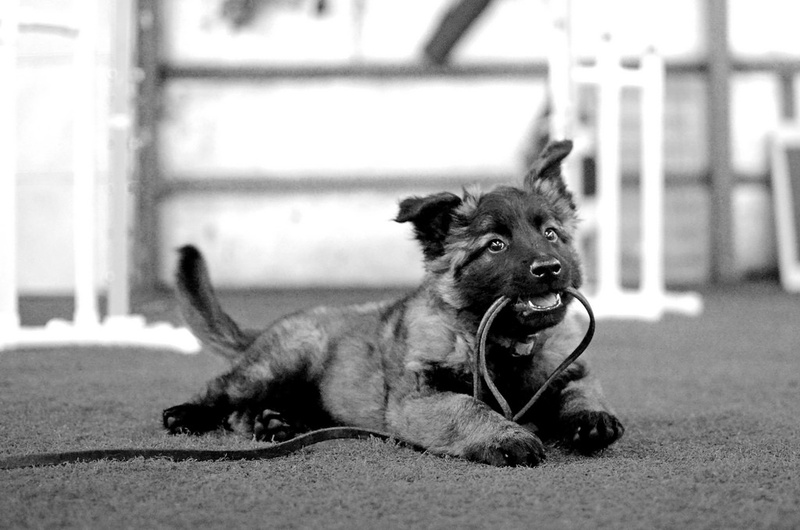 The most popular and competitive is AKC, but the UKC also offers it, as well as an organization called CDSP which offers a more laid-back environment, allows you to talk to your dog in the ring, and will allow certain judge-approved exercise modifications for dogs with physical concerns. Steve, a Border Collie, at full speed. Photo by Jim Geiser Photography. For dogs and owners who enjoy a faster-paced game, the sport of flyball may be just what you’re looking for. 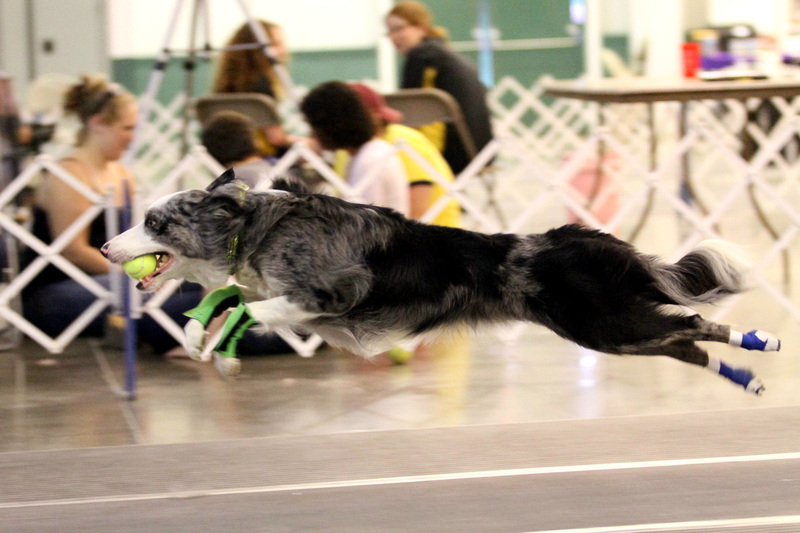 In flyball, teams of four dogs race one another over a course of four jumps to the flyball “box” which pops out a tennis ball for the dog to catch before racing back. It is fast and LOUD and chaotic and a ton of fun. 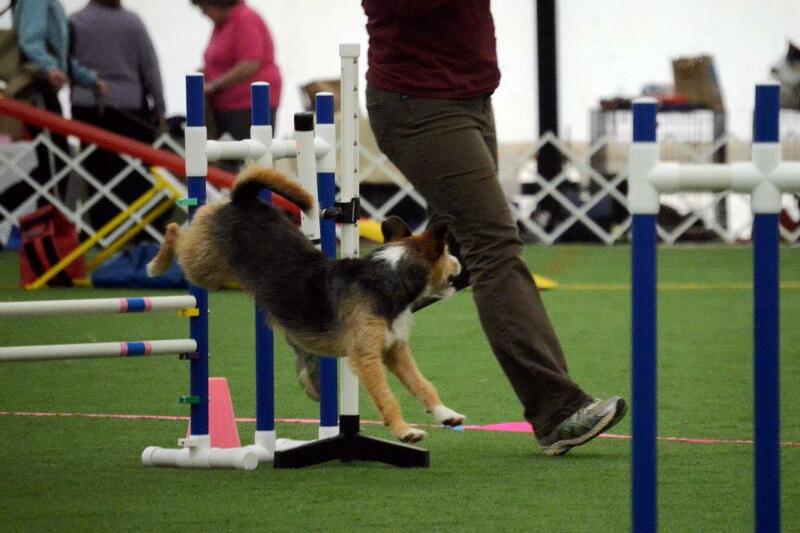 Flyball is a sport that dogs of all sizes, breeds, and mixes can play, but is best suited to small and medium dogs. Dogs need to be interested in tennis balls and able to focus on a job in the midst of barking and running dogs. But you start off slowly in training and gradually build up to the point of chaos. Agility combines both technical skill and speed. In agility, dogs navigate courses consisting of jumps, tunnels, and sometimes equipment called a dogwalk and an a-frame that they have to climb, and a teeter-totter that tips under their feet. There are a wide variety of different “games” varying from one organization to another. In some games, the handler gets to make up their own course with certain point or equipment requirements. In other games dogs have to take the jumps and obstacles in a certain order. Open to dogs of all sizes and shapes, there’s a venue suitable for everyone. Agility takes a lot of time and work to do well and to do safely. Dogs need to understand how to handle the equipment in a safe manner, and handlers need to learn how to direct their dogs to turn and discriminate between obstacles. And to stay at the start line (that’s a hard one!). It can be overwhelming and awkward at first, but once you get the hang of it, it is a ton of fun, and there is always a new challenge to face. Truly I think there are few things as beautiful in the world as watching a sighthound lure course. In this game, dogs chase a moving lure around a pre-set course. Mostly trials are for Sighthounds (Greyhounds, Whippets, etc) but it is a game that appeals to many different breeds (herding dogs! terriers!). 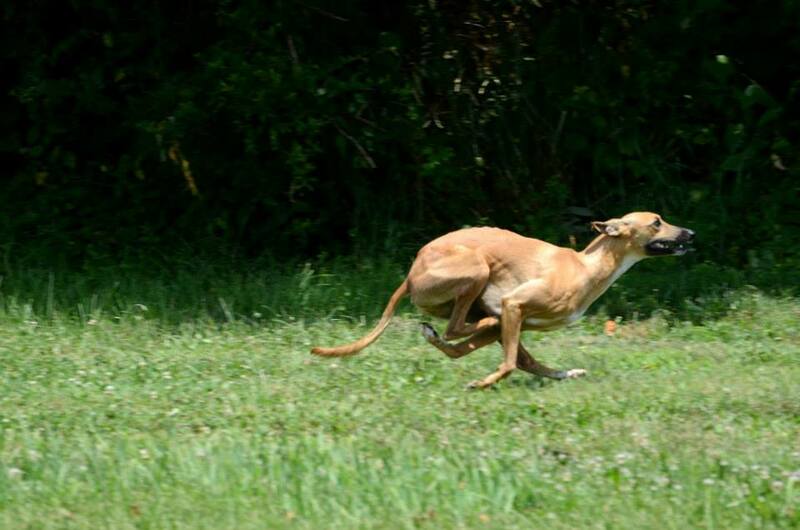 The AKC has even made lure-coursing available to all breeds through their Coursing Aptitude Test, and several training clubs in the area hold classes or fun events where your dog can try the sport on for size. Last but not least in this overview of a number of the games out there to play with your dogs (part two coming soon– there are SO MANY OPTIONS! ), is the brand new sport of Barnhunt. In Barnhunt, dogs of all sizes and breeds and mixes are released to locate and signal where on a course of hay bales and loose straw rats are hidden in secure tubes. Many dogs are natural hunters, and this game encourages to use their noses to sniff out vermin. 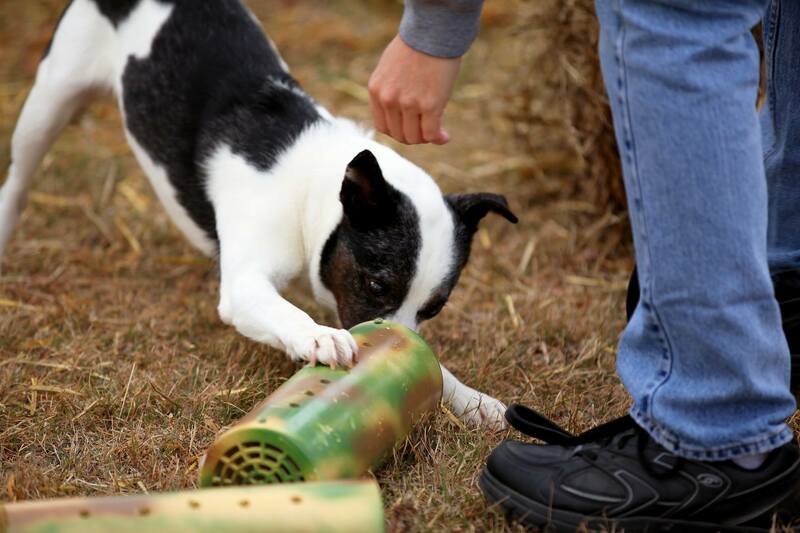 There have long been terrier-only games that included searching out rats, but for the first time, it has been designed in a way that allows dogs large and small to participate. Dogs love being given an outlet for their natural instincts, and Barnhunt plays perfectly into the very essence of being a dog. I hope you enjoyed this summary of just a few of the dog sports out there to play with your dog. I have a list of half-a-dozen more for another time, but if something on this list inspired you or sparked an interest, I hope that you pursue it. Maybe a child in your household would find one of these sports fun– there are junior handler programs for many of them. Whatever you think when reading this, I hope it encourages you to get out there and do something with your dog that will enrich both of your lives. The Scoop on Poop: Or, why we ask you to bring a stool sample. Poop is gross. Make no mistake– we get that. But examining a stool sample for parasites on an annual basis is a great way to make sure that both your pet and your family stay as healthy as possible. Intestinal parasites can not only make pets sick, but they are easily spread from one pet to another, within the family or, if your dog goes places like the dog park, to dogs outside the family. What is even more distressing is that some intestinal worms are also transmissable to humans. This is a bigger concern in families where there are children who might play outside a lot and maybe not always remember to wash their hands. It is also a concern in families that include people with compromised immune systems. It is such an easy risk to mitigate simply by bringing a stool sample along to your pet’s annual visit. Stink bugs are fun to play with. And crunchy. But, you ask, what if my pet is an indoor pet? Clearly, animals who are kept primarily outdoors are at a higher risk of contracting intestinal parasites because their exposure is higher. 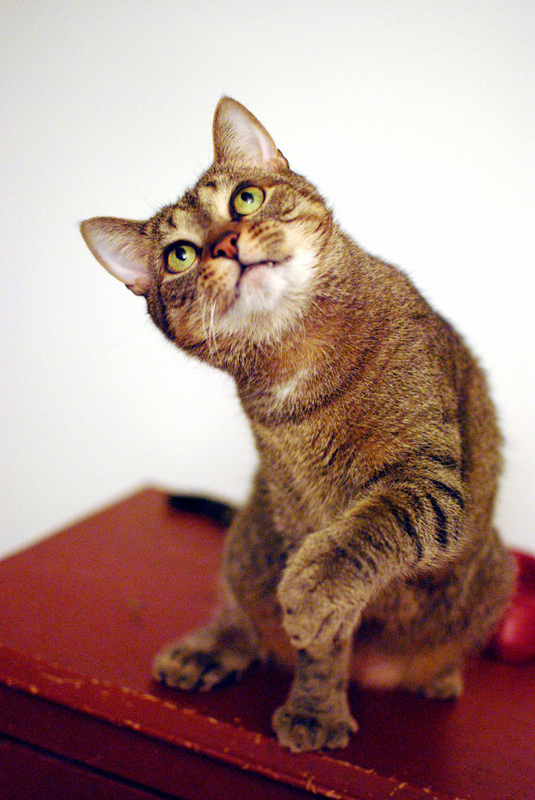 Cats especially are frequent hunters, and their prey can carry and pass along parasites. But even indoor pets are at risk. Does your dog not ever leave the house even to relieve himself? There are many cats who truly do not ever leave the house. While their risk of infection is significantly lower, it is not zero. Rodents can get into your house and pass along parasites. Certain bugs are guilty as well– cockroaches, some types of flies, and even stink bugs (and who doesn’t get stink bugs?) It is also entirely possible for any person coming into the house to bring the shed eggs in on their shoes. Indoor pets do not live in a vacuum; parasites are everywhere. What about dogs who are on monthly Heartworm Preventative? Both Sentinel and Heartgard work as monthly dewormers for intestinal parasites, but they are labeled to “control” (but not necessarily eliminate) the worm population and keep the pet from becoming sick from them. This monthly deworming is one of the reasons why we encourage people to give Heartworm preventative even through the winter months when mosquitos are dormant and the risk of contracting heartworms is very low. Unfortunately, no Heartworm preventative is going to offer complete protection against all intestinal parasites, and they completely miss coccidia, a common single-celled organism that can cause terrible diarrhea. So what are the most common intestinal parasites? Roundworms are especially common, especially in puppies and kittens. They are frequently passed from mother to babies, whether before they are born or while they are nursing. The tricky thing about roundworms is that when they infect a dog, some of the larva will migrate into the body’s tissue and lie dormant. They then can be reactivated by the hormones produced during pregnancy, so even if the mother of the litter had a clear stool sample checked before pregnancy, she can still transmit worms to her pups. Roundworms are most dangerous in very young animals who simply do not have the strength and immune system to fight them. 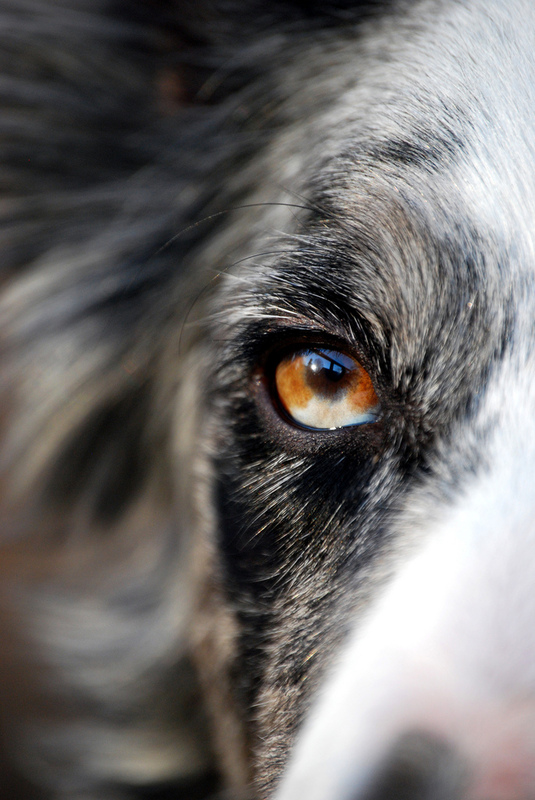 In healthy adult pets, infections are generally not serious. But. Roundworms can be transmitted to people. Young children may become infected by ingesting dirt contaminated with animal feces. Sandboxes are frequent favorite bathrooms for stray and outdoor cats, and children may be exposed there. Hand-washing is extremely important. Adults who work outside, in the garden for example, are also at risk of being exposed, as well as people cleaning litterboxes. Bottom line? Wash your hands! Hookworms are another frequent offender. Hookworms can be a bit uglier than their roundworm companions. They are transmitted either by ingestion of the eggs, or by larva penetrating the feet and migrating through the body. Hook worms do more damage than roundworms, as they tear out tiny pieces of the intestinal wall for nourishment, resulting in blood loss in the pet. Dark stools, bloody diarrhea, and weight loss are the most common signs of a hookworm infestation. And like the roundworm, hookworms can infect people. They can penetrate the bare skin of humans in the same way that they can our pets. The best prevention is a clean yard, shoes, and regular stool checks to make sure your pet is not contaminating his environment. Whipworms seem to be becoming more common in this area recently, or at least we have been finding more of them on stool checks. The most common symptoms are poor condition, weight loss, and in severe infections, chronic bloody diarrhea. Whipworms can be very difficult to get rid of in the environment. Under favorable conditions, eggs can remain infective for up to five years in the environment. Keeping a clean yard and checking stool samples regularly are the best way to prevent environmental contamination. 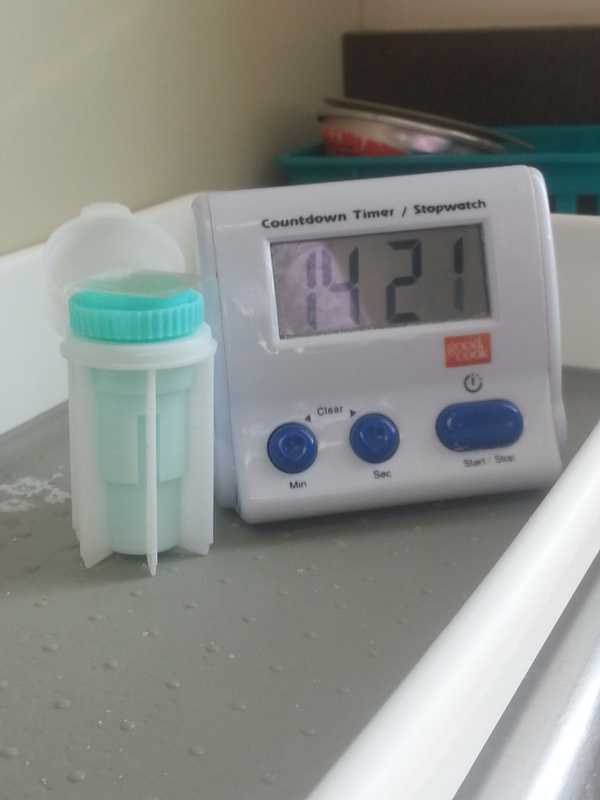 A stool sample test in progress. Tapeworms are a little bit different. In order to acquire tape worms, your pet needs to ingest a flea, whether through grooming or hunting. Tape worms do not show up very well on stool samples– the easiest way to diagnose them is through the observation of worm segments on your pet or one of his common sleepng areas. Tape segments look like grains of white rice. If you see these, you should give us a call. Tape worms require the intermediary host of the flea. They cannot be passed pet to pet or pet to human. They are, however, a warning sign of flea infestation, so that is something you also want to stay on top of. And last but not least is coccidia, which is not a worm, but a single-celled organism called a protozoa. Again, this is most commonly spread from ingestion of the parasite. The most common sign is, once again, diarrhea. All of these different parasites require different types of dewormers. While there are deworming medications for pets available in some pet stores and in feed stores, they often are not very effective, and are usually only effective against one type of parasite. This isn’t helpful if that’s not what your pet has. We at White Oaks Veterinary Hospital recommend annual stool samples so that we can properly diagnose and treat any parasites that your pet has picked up. And any time your pet is being seen for diarrhea, you should definitely bring a stool sample along, as parasites are a frequent cause of intestinal issues. We wamt to do our best to keep your pets and your family as healthy as possible, and regular stool checks are a very useful tool that we can use. Please try to remember to bring one to your pet’s next visit!